Lusaka Mayor Wilson Kalumba has warned of stern action against liquor traders and owners of drinking places found selling alcoholic beverages to persons under the age of 18. Officially launching the Zambian Breweries’ new “18Plus SAY NO TO UNDERAGE DRINKING” campaign to stamp out underage drinking, Kalumba disclosed that the Lusaka City Council (LCC) is working with other partners in bringing to book those found selling to minors. 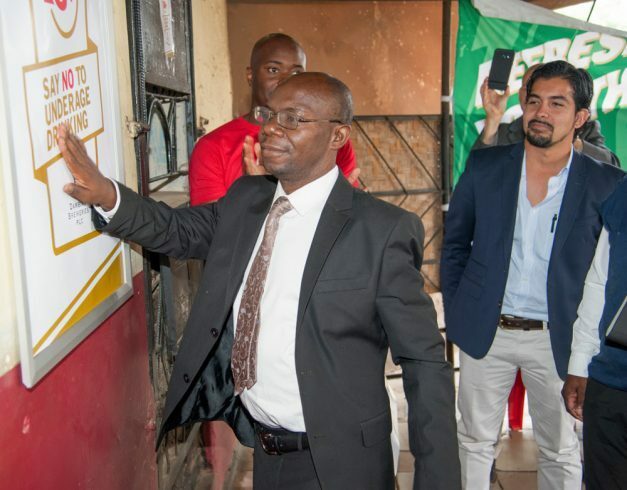 The 18+ campaign, which is part of a global campaign by Zambian Breweries’ parent company AB InBev, is being rolled out in bars, pubs and other outlets across Lusaka in a bid to ensure that the law preventing the sale and consumption of alcohol by under 18s is enforced and adhered to. “This 18+ campaign is very important not only to Zambian Breweries and the ambassadors who will be going around schools sensitising the pupils on the dangers of alcohol consumption and abuse, but to the nation as a whole. “It is our hope as a government that all youths below the age of 18 years do not consume alcoholic beverages,” Kalumba told guests at the campaign launch in Lusaka on Friday. He commended Zambian Breweries for promoting smart responsible drinking and discouraged underage drinking and hoped the launch of the 18 + campaign would bring solutions to the issue of underage drinking. Kalumba further called on bar owners not to sell alcoholic beverages to anyone under the age of 18. “I look forward to a situation where I will see alcohol traders refusing to sell to anyone they suspect is below the age of 18. For those that are above 18 years old but look young, maybe they should move with their NRCs but again our call just like Zambian Breweries is on smart responsible drinking. Let us all be on top of things and ensure that we raise a generation that is free of drunkards and drinks responsibly,” he said. And speaking during the launch in Libala at which Zambian Breweries “ambassadors” began distribution of posters and stickers, Zambian Breweries Country Director Jose Daniel Moran said the company was concerned with alcohol abuse and truly committed to fight underage drinking hence launching a campaign that would directly address the matter. He said the company wanted to ensure that youths below the age of 18 years were not drinking any alcoholic beverages. The 18+ ambassadors will also be going into schools to sensitise pupils on the dangers of alcohol consumption and abuse, he said. Moran said stakeholders had a responsibility to help consumers make better choices and be aware of the harm alcohol can have if not consumed responsibly. “We are concerned with the effects of alcohol drinking among youths. It is the responsibility of all stakeholders to ensure that the youths under the age of 18 do not consume alcoholic beverages,” he said, who emphasised that retailers and other adults who allowed easy access to alcohol to minors must be held accountable. Young people needed to be aware of the health implications of alcohol abuse, especially at an age when they were not prepared mentally nor physically to have these choices, explained. Beer drinking has caused more harm to this country than any disease ie malaria, AIDS…etc put together! it has increased poverty, dearth rate, reduced life expectancy, increased prostitution & other evils. Brewing industry is raking-in a whooping 20million US Dollars in profits every month, with CEOs living luxury and driving ultra modern vehicles bought by poor zambias pictured on online media lying in spills of dirty water, paralyised by beer, while others are escorted to graveyards through drinking related accidents,murders,ill-health..name it! The revenue and employment attributed to this evil industry cannot replace people’s lives! May all people of this christian nation refrain from this culture of drinking to make families and zambia itself better! Adults should be examples. Cat and mouse.. Fools game continues..vested interest should come into play our Honourable Mayor. Tell me how can brewer be at the same educator of harms of its products? Would they be genuine in stating facts about harms? We have for long time asked government to collect an alcohol levy. This levy can be dedicated to law enforcement by the council. National Alcohol Policy. Look at chippies, game, spur, shoprite are selling alcohol?